"Tree Stuck In Cat; Firefighters Baffled!" "Sims Everywhere Agree: The Egg Came First, But Only After The Chicken"
"Sims Everywhere Agree: If You Throw A Stone, It Will Hit Something"
"Local Scientists Conclude: Kitties Like Fish, Dogs Less Picky"
"SimSurvey: 4 Out Of 5 Sims Surveyed Find Surveys Satisfactory"
"Original Magna Carta Found Written On Large Broccoli Stalk"
"Bookstore Gets New Copies Of SimUlations: A Love Story"
"Lou Turns Away Every Person Who Skips To Her"
"Eyes Move While Reading Tickers, Scientists Speculate"
This is no ordinary dense industrial building. When queried, you find it's name to be the 'SimMars Research and Testing Facility'. This seems to be a hint by Maxis toward the upcoming 'Sim' by Maxis, SimMars. GeekLife.com put up list of SimCity 3000 command keys on the keyboard. They have a .JPEG image of a keyboard with labels over the keys - looks very useful. View it and print it out here. 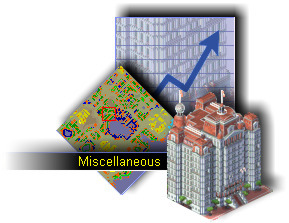 If you have SimCity 3000 you would have noticed that it does not have a terrain editor included. The only way to make your own terrain was from grayscale bitmaps... until now. 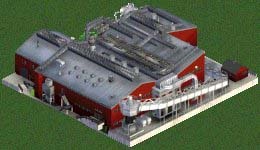 CyberWyre has released their full version SimCity 3000 Terrain Editor free to download! The terrain editor is a stand-alone program, and has all the tools you'll need to make a terrain. It also has separate 2D and 3D modes to preview your maps in. Go to their site for more information and to download it, here. Note: for some reason the installation of the editor threatened to alter some system file on my computer and it wouldn't install.... hope it'll work on yours.